We've got a pumpkin patch growing in the classroom ... and I'm loving it! We took a few minutes this morning and made our pumpkins. You can find instructions on how to make them HERE at First Palette. The only difference was that we used 6 sections instead of the 10 shown on the website. 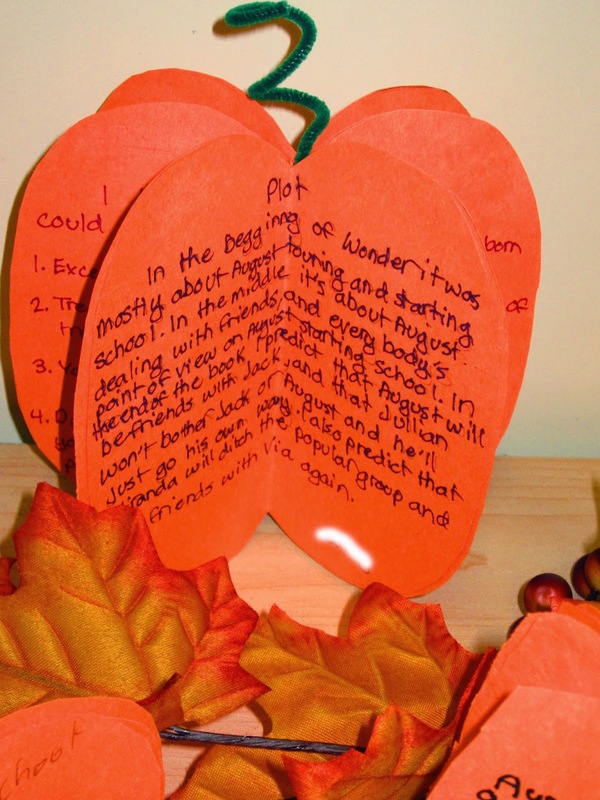 We turned our pumpkins into a seasonal language activity by incorporating the story elements we've been studying in class. 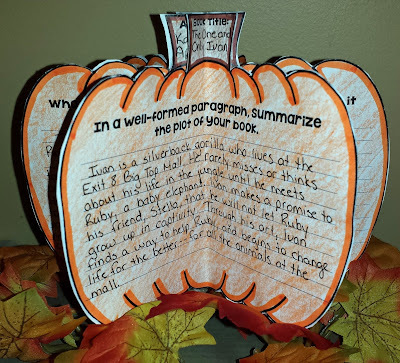 Using our read aloud, Wonder, we wrote about the story elements on each of the pumpkin sections: plot, character, setting, conflict, resolution, point of view, and theme. This was a perfect activity for the day before Halloween, and it makes a perfect formative assessment activity (handy for collecting marks in the last few days before report cards are due). Those are cute pumpkins, Jen! Did you get hit hard with Sandy? Not too bad in my area but the winds were (and still are somewhat) ferocious. Hope you managed to stay safe! I love your blog! I really want to incorporate all your folding ideas! I'm trying to figure out how I can squeeze in your pumpkin project tomorrow. So FUN! This is a great idea!!! A wonderful tool to prove understanding! I am reading aloud Wonder also. We just started it a few days ago. Do you have your kids do anything to respond to with your read alouds? Some teachers I know ask a question after they read and the kids write their responses in their notebooks. Some days are so packed I can only squeeze in 10- 15 minutes of read aloud time after lunch. Love it! Our whole school (grades 3-5) has started reading Wonder as a read aloud during their reading classes. We have incorporated the theme of Choose Kind into our school "theme" for this year. Love this idea! I am sharing it with the reading teachers at each grade level. THANKS!!! I love this idea! This is so cute and different from most foldables! TOO CUTE!! I'm doing this!! I am so borrowing this idea! Love it, love it, love it! Thank you for sharing.